Posted by Nicole Richards on Tuesday, March 29th, 2016 at 9:18am. Active on the market; is featuring this 5 bedroom, 4 ½ bath ranch style two story home with 5108 sq. feet of living space. The home includes modern upgrades such as a gourmet style kitchen, French glass doors and a beautiful covered patio with arched architecture structures and the views of a serene garden and wooded landscape. Nestled on a pristine and very private 10+ acre lot, which is also zoned for Agricultural exemptions (8.5+/- zoned AG for lower taxes) rests a bonus building of 2669 sq. feet and completely offers a second story for ample space. The space could satisfy an in-law suite, office, apartment, stable or 3-car garage. 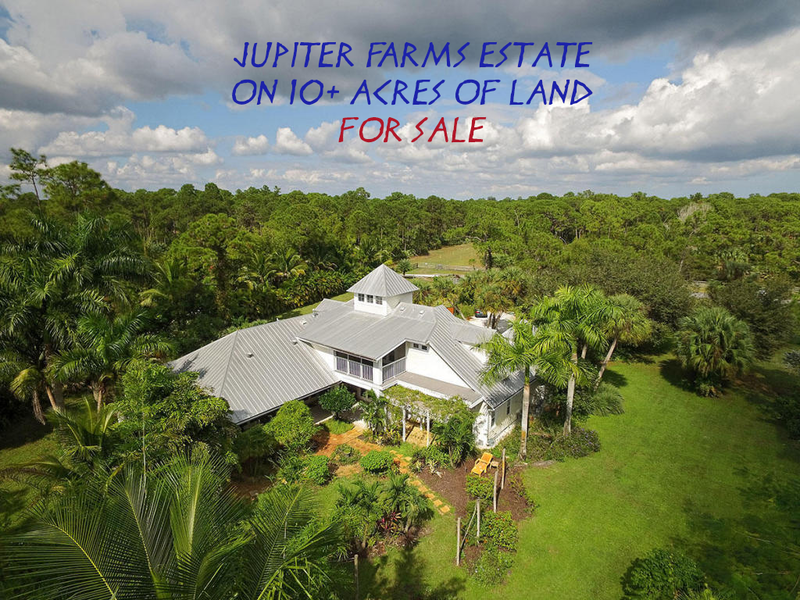 Jupiter Farms also offers many back trails to ride horses and has plenty of shops and grocery stores nearby for ultimate convenience. The Farms also has soccer fields, playgrounds and plenty of space for extracurricular activities! Plus, a New Park is in the works! Phone #: 561-746-7272 / Email: carlos@wfpcc.com!